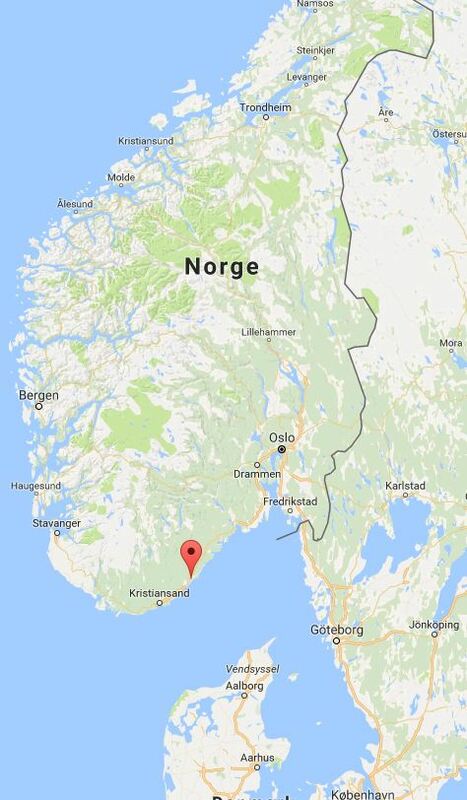 The Smart Village Skarpnes (58.43°N, 8.72°E) is located close to the city of Arendal in South of Norway. 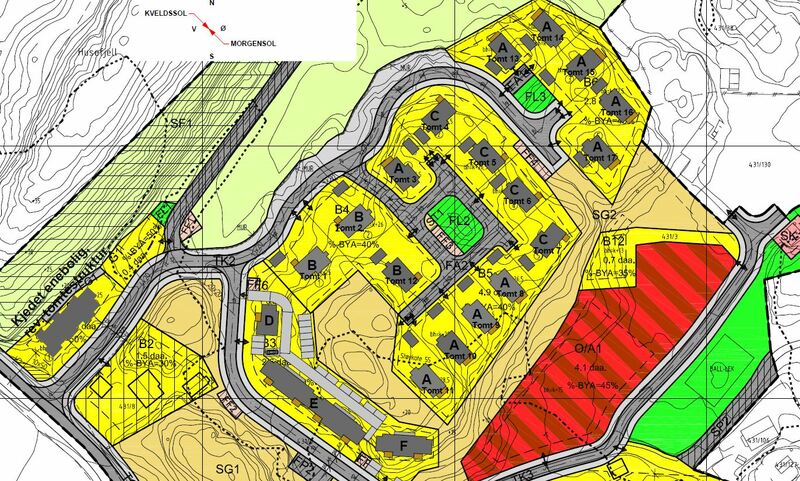 An overview of the building site and the building orientations is shown below. Upon completion, the village will have a total of 17 detached houses and 3 apartment blocks with 20 units. The developer is Skanska AS, collaborating with Ramboll AS (architecture), Multiconsult (consulting), and others. The houses at Skarpnes are single family homes built according to the passive house standard NS3700. This means that the heating demand is extremely low. Five of the houses are built as nearly Zero Energy Buildings (nZEB), where all technical solutions are carefully designed to minimize the annual energy consumption. The five houses have pitched roofs with BIPV systems that are oriented South-East and South-West. This makes it an interesting case for comparison of PV energy production and the degree of matching with the energy consumption in the households. Each house is fully instrumented for data collection of electricity production and consumption, grid quality parameters (voltage and frequency variation, harmonics, etc), and indoor climate conditions (temperature, relative humidity, and carbon dioxide levels). Kamstrup flow meters are installed to measure hot water consumption, and a large number of ABB electricity meters are installed on the main electrical circuits in the households to evaluate energy consumption patterns and peak power demands. 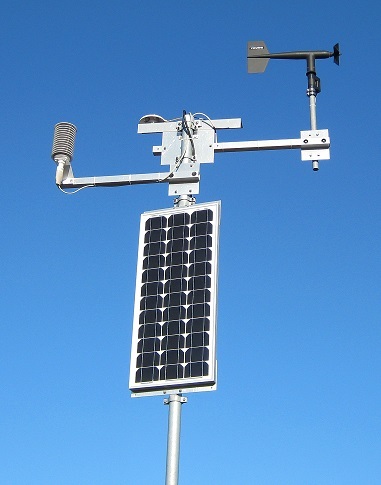 At Skarpnes, a weather station measures ambient temperature, wind speed and direction, and relative humidity. Global horizontal irradiation (GHI) is measured with a Kipp & Zonen CMP11 pyranometer at 1-minute resolution. An Apogee reference cell (mono-crystalline) is placed next to the CMP11 for direct comparison of irradiation readings, and five additional Apogee instruments with diffusers are placed on the roofs of the nZEB houses in order to evaluate the PV system efficiency and performance ratio (PR). Additionally, a temperature sensor is mounted at the back of one PV module on each roof. This allows monitoring of the operational conditions for the BIPV roof and analysis of temperature-dependent performance characteristics of the modules. Each of the five nZEB houses have installed 32 mono-crystalline silicon PV modules (2 strings of 16 modules). The PV module type is Sunpower 230 NE-BLK-I (230 Wp). 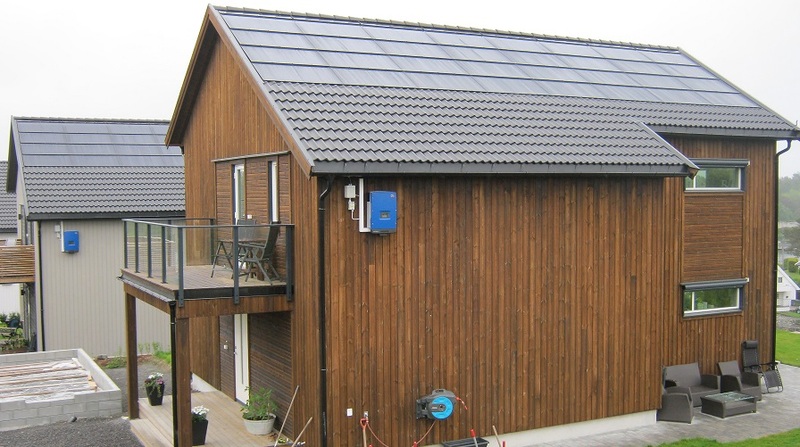 The modules are integrated into the roof by means of the SOLRIF system from Schweizer and is a 'true' BIPV system replacing ordinary roof tiles. The roof has a slope angle of 32º. 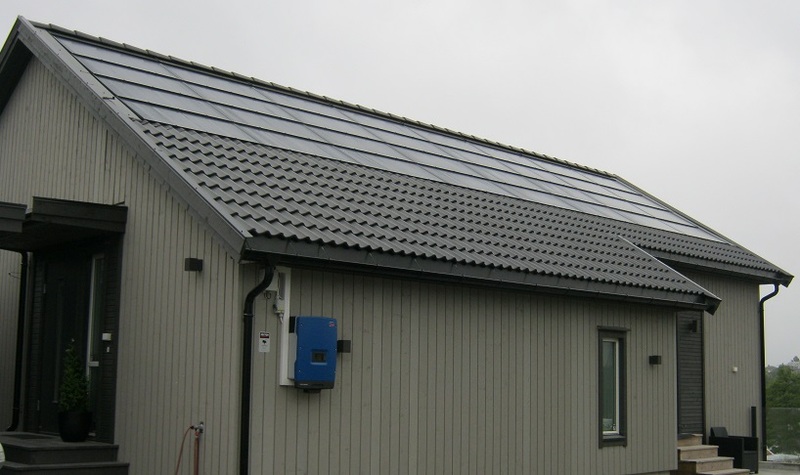 The total installed PV capacity is 7.36 kWp, connected to a SMA Tripower inverter model 7000TL20 (3-phase) of 7.0 kW capacity. The PV system is expected to produce around 7 MWh annually, enough to cover the estimated annual electricity consumption of the household and thereby achieve a zero energy budget. The figure below displays the monthly production (AC from the inverter) of the BIPV-systems on the 5 houses at Skarpnes. The table gives the annual specific yield based on the collected data (Sep'15-Aug'16). 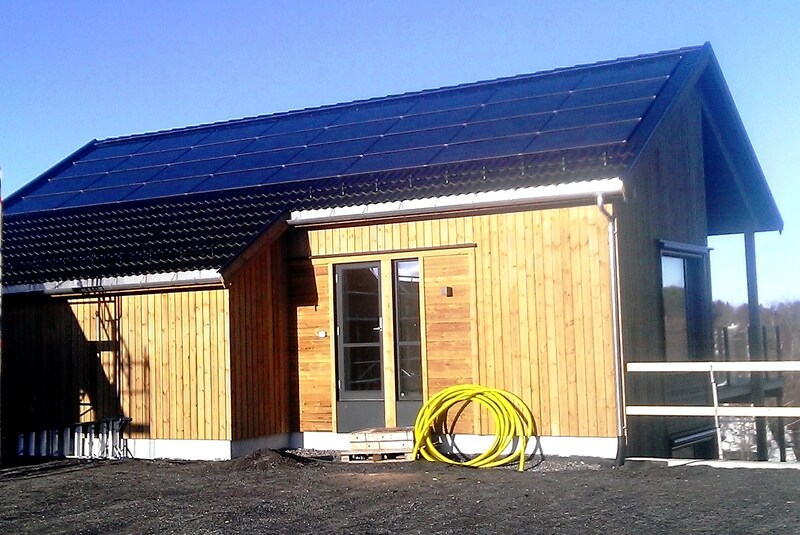 The Skarpnes is a pilot project in The Research Centre on Zero Emission Buildings (ZEB). For more information, see the ZEB webpage. The project "Electricity Usage in Smart Village Skarpnes" is supported by the Norwegian Research Council (EnergiX project 226139). The project aims to find out how BIPV impacts the load profiles and peak loads of a residential area dominated by passive houses. The load profiles of a cluster of several passive houses will provide information decisive for future grid dimensioning where voltage variation between maximum production and maximum demand is the limiting parameter. The low annual electricity consumption of passive houses points towards a possibility for reduced grid capacity, particularly if part of the houses’ electricity consumption is covered by locally produced electricity. On the contrary one might possibly experience that the annual peaks are equally high in passive houses as in traditional houses and that they occur on days with little or no local electricity generation (mid-winter). If so, the potential for reduced grid capacity might not be present. Until now there has not been enough data available to support any conclusions on this issue. The project at Skarpnes will provide such data to the decision makers. For more information, contact Teknova AS.